French dramatist and miscellaneous writer, born in Paris in 1595. When he was about thirty he was introduced to Cardinal Richelieu, and became one of the band of writers who carried out the cardinal's literary ideas. Desmarets's own inclination was to novel writing, and the success of his romance Ariane in 1631 led to his formal admission to the circle that met at the house of Valentine Conrart and later developed into the Académie Française. Desmarets was its first chancellor. It was at Richelieu's request that he began to write for the theater. In this kind he produced a comedy long regarded as a masterpiece, Les Visionnaires (1637); a prose-tragedy, Érigone (1638); and Scipion (1639), a tragedy in verse. His success led to official preferment, and he was made conseiller du roi, contrôleur général de l'extraordinaire des guerres, and secretary general of the fleet of the Levant. His long epic Clovis (1657) is noteworthy because Desmarets rejected the traditional pagan background, and maintained that Christian imagery should supplant it. With this standpoint he contributed several works in defense of the moderns in the famous quarrel between the Ancients and Moderns. In his later years Desmarets devoted himself chiefly to producing a quantity of religious poems, of which the best known is perhaps his verse translation of the Office de la Vierge (1645). 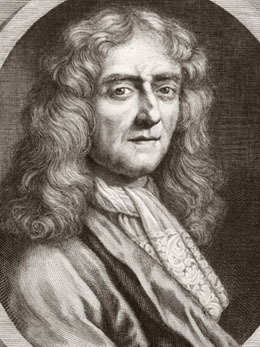 He was a violent opponent of the Jansenists, against whom he wrote a Réponse à l'insolente apologie de Port-Royal... (1666). He died in Paris on the 28th of October 1676.